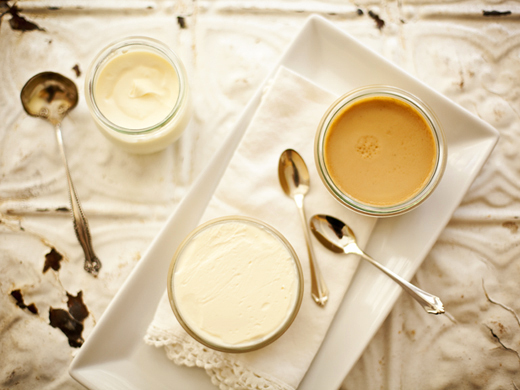 I developed this butterscotch pot de crème recipe for Tilia‘s dessert menu. Steven Brown, the chef/owner wanted a turbo charged version of the butterscotch pudding from his childhood. We went with a Pot de crème, which is essentially as decadent as creme brulee, without the crack of caramel resting on top. The texture is like silk and the taste is lightly sweet, with just a slight bitter edge from the burnt sugar in the butterscotch. Cooking the butter and brown sugar together until it is smokin’ hot (and I do mean smoking) is the key to the flavor. If you don’t bring them to the brink of burning the pudding will be way too sweet for my taste. The crème fraîche (young sour cream) is unsweetened and the perfect balance for the pudding. If you don’t happen to live near Linden Hills (a small village of a neighborhood in Minneapolis), where you can order this at Tilia, you can now make it at home. You can watch me make this Buttercotch Pot de Crème on my instagram stories. This quintessential southern dessert is found on the back of the box of Nilla wafers. You can certainly use Nilla brand wafers for this banana pudding and there will be no judgment and it will taste just like you remember when you ate it as a kid. OR you can make your own vanilla wafer cookies and be so glad you did. They are super easy and fast to make and they don’t have any of that cardboard box flavor overtones. Wait, did that just come across as judgy? Either way you are going to love this recipe. I was inspired to make it after an old friend from high school (that’s a very old friend) made it for New Years Eve and posted pictures on Instagram. I found the Nilla wafer recipe in the BraveTart cookbook by Stella Parks. For those of you who follow me on Instagram you probably have seen my pastry tutorial “stories.” I’m slightly obsessed with working through a recipe in 15 second intervals, often with eclectic baking music. You’ll find this banana pudding recipe made from start to finish on my Instagram page archived in my “highlights.” There are many other recipes and techniques you may want to check out.